Just when I think I've got figured out in life, I managed to get a curveball thrown my way. In the case of this review, it's that way with Quaker throwing me a curveball with something that is unlike my previous reviews. 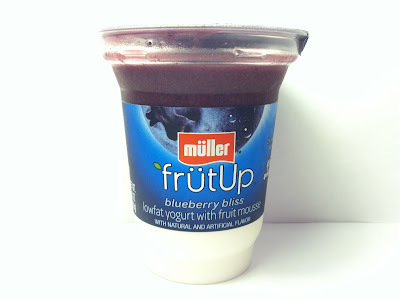 What I mean is that I always figured that Quaker stuck to oats and granola related snack and breakfast products, but one day I was walking through the dairy case in my local Meijer and I found this Muller FrutUp Blueberry Bliss Lowfat Yogurt with Fruit Mousse, which was a product I had never seen before, so I became curious. Upon closer inspection, I saw the good ol' Quaker Oats man on the container, so much to my surprise, it was then that I found out that Quaker is not just breakfast and snacks, but also dairy and with some more research, I've also come to find out it is a European import. It makes sense, but it was a surprise to me nonetheless. Anyway, piqued by curiosity, I grabbed this 5.3 ounce container out of the dairy case for $1.00 and was anxious to give it a try. By the way, it's 140 calories and has seven grams of protein. As you can see by the label and also the picture above, this is not your typical yogurt product. It's a base layer of regular lowfat yogurt that is then topped with a layer of fruit mousse. I've obviously seen mousse before and reviewed some of those products, but I can't say I've ever seen it presented in this manner before. In the case of this mousse, it was obviously blueberry and it smelled nicely of blueberry and had the composition of the typical mousse that you mind find in a snack cup, although this one more like a jam than some of the Jell-O products that I've had. Mixed together, the mousse and plain yogurt pretty much turned into a blueberry yogurt, as you can see above. Taking my first spoonful, I had a general idea what to expect but wasn't quite sure based on the fact that I've never mixed mousse and yogurt together before. What I got was a product that tasted like both things, which was somewhat of a surprise to me since I expected them to kind of blend together. Instead, the yogurt maintained its cool dairy feel and the mousse itself maintained its airy texture like a typical mousse. As for the flavors, the yogurt was plain as you'd expect, but the mousse itself was sweet and had a wonderful blueberry taste without the tang and bite that blueberries can sometimes have. Mixed together, it was like a blueberry yogurt...except with a mousse mouthfeel. Totally different than anything I've ever reviewed for this blog before, but it was in a good way. Buy It or Fly By It? I liked this a lot and it was pretty much bliss in the fact that the blueberry flavor was wonderful and mixed well with the yogurt, so it gets a BUY IT rating. 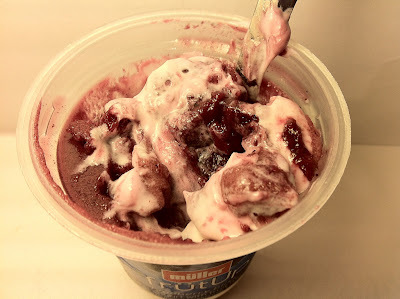 Once I got more used to the feeling of mousse and yogurt having a different kind of feeling in my mouth, I got more addicted with each successive spoonful. If you were to pick this up and adjust to it as I did, I think you'd find it just as addictive and blissful as I did. This looks really tasty... I will have to keep an eye out for it at the store. I just tried it - in fact I tried the lemon and raspberry. I was not all that thrilled. The mousse would better be described as aired jello or a firm foam (which is so popular in Europe right now.) I find foams really boring and not very appetizing to look at on the plate, but I digress. The texture of the fruit mousse did not have that of a good fruit mousse. The package in reality has very little yogurt in it and if you look at the label, it gets the gelatin from Tilapia fish. 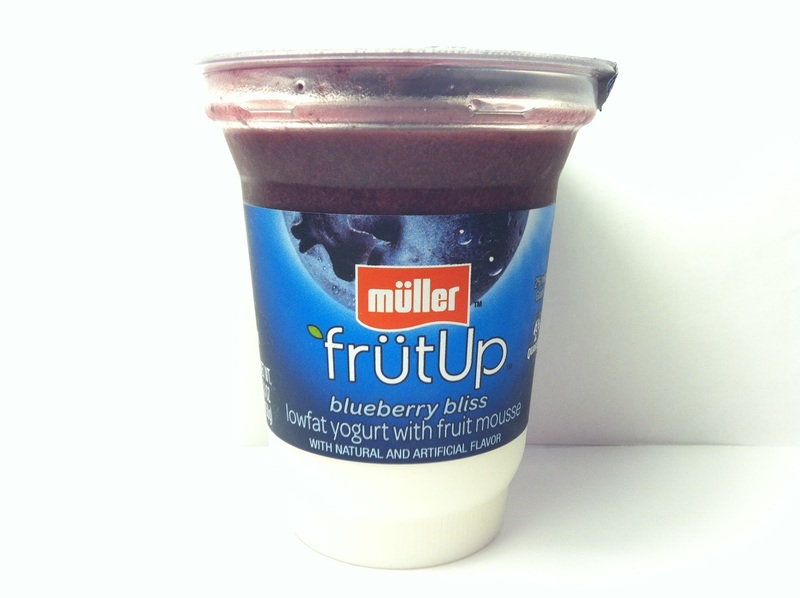 The joint venture between PepsiCo, Inc. and the Theo Müller Group must have been the result of good sell-job and price to create the Müller Quaker Dairy and the FrütUp product line. Unfortunately, I think PepsiCo, Inc (who owns Quaker) should branch into areas that are more to what they know. Well, I was happy to see new yoghurt product so I got some. The taste is not what I could go crazy about. It was very sweet and the yoghurt flavor-not much to beggin with, got lost in the sweetnes of the whipped jello foam. BUT, what got me after I ate it and read the ingredience, there is a TILAPIA!!!! A freeking FISH! Now I like fish but not some by pruducts used in my food, never ming yoghurt! Isn't enough that we are forced to eat chemicals and aditives and GM food? Now fish in the yoghurt. I am in food business and know how things are made and understand why and what sometimes is aded. But fish in yoghurt? There are other ways to get gelatin!!! Or perhaps that would eat in the proffit of the company. I guess I stay with making my own yoghurt and mix in my fresh fruit. Thanks to our local produce and farmers for producing natural food! ok, your typical gelatin is made of cow bones, not much different between bones. a bone is a bone.